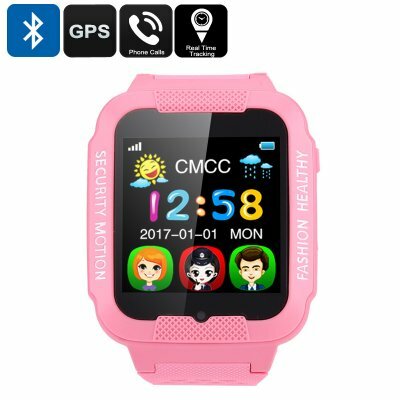 Successfully Added Child GPS Watch - 1.63 Inch Touch Screen, GPS Tracking, Geo-Fence, Pedometer, Phone Calls, Real Time Tracking (Pink) to your Shopping Cart. As a parent, you can never be too safe when it comes to your child. That's why we bring you these fantastic kids watch with GPS tracker and call functions. At any time you'll be able to open the companion app and see your kids location. With the ability to track your child throughout the day without being intrusive this kids watch and GPS tracker brings you the peace of mind that every parent deserves. This kids GPS watch phone with geo-fencing, real-time trajectory, as well as tracking and position, will let you pinpoint your child location any time of day through the easy to use the smartphone app. After setting the boundaries this smart watch will send out notifications if it detects that your young one has wandered across them. So if they're playing outside or if you're busy in another room of the house you'll know if they've strayed too far. With a two-way voice intercom, it's easy to contact your little ones should the linger on the way home and if they ever get lost, scared or panic then you'll only be a button press away. As this kid's smart watch is SIM-enabled and works across all GSM 850/ 900/ 1800/ 1900MHz frequencies it can be tracked everywhere, even internationally which makes holidays much less stressful. Able to store a number of contacts the phone let your child make and receive calls to pre-screened numbers. A built-in pedometer will even recall the number of steps taken and with a host of other helpful functions such as calendar, alarm, and calculator these smart looking kids watch will help protect and empower your kid to explore the world around them without fear. This kids GPS smart watch comes with 12 months warranty, brought to you by the leader in electronic devices as well as wholesale smart watches and watch phones..